Ban Ki-moon said the UN would stick to using the term Rohingya, despite objections by the Burmese government and Arakanese Buddhist community. “The affected population—referred to as Bengalis by the government of Myanmar but known as Rohingya in the United Nations and in much of the international community. US President Obama called for Myanmar to allow stateless Rohingya Muslims to become citizens. Obama also said he was ‘deeply concerned’ about the marginalized group. The East Asia Summit in Myanmar's capital Naypyidaw last week was meant to be the country's crowning glory, and evidence that the government had successfully introduced political and economic reforms. While many Myanmar government leaders admit that there is still much to be done, especially in education, health and social welfare, many of the world and regional leaders in Myanmar for the summit must have been dismayed to see the reality -- there are few tangible results from the political and economic reform process started nearly four years ago, when Thein Sein became president and formed a quasi-civilian administration. The world`s most powerful leaders expressed concern over the religious and racial discrimination in Myanmar. Burma`s 2 million Muslims account for roughly 4 percent of the population, according to the country’s last official census, conducted in 1983. Despite a history of religious intolerance and inter-communal mistrust, most of the ethnically diverse Muslim population is geographically dispersed and socially integrated. By contrast, the approximately 800,000 Rohingya Muslims, who were excluded from the 1983 census, are mainly concentrated in Burma/Myanmar’s western Arakan/Rakhine state. Rohingya Muslims were made stateless by the Citizenship Law of 1982, which designates that only members of officially recognized ethnic groups are eligible. Since the government fails to recognize Rohingya as an ethnic group, the law automatically renders all members of the group non-citizens. While President Thein Sein’s administration continues to claim that Rohingya are illegal Bengali immigrants, many Rohingya have been in the country for generations. Rohingya face ongoing discriminatory state policies, including restrictions upon marriage and births, forcible displacement and other crimes. In May 2013 authorities in Arakan/Rakhine state re-introduced an order restricting Rohingya families to just two children. The order, first established in 1994, had previously lapsed. Myanmar’s Muslim Rohingya minority — a community which has faced institutionalized discrimination for decades. In June 2012, religious tensions erupted into vicious violence between the state’s Buddhists and Muslims, disproportionately affecting the latter. Clashes have continued sporadically since and spread to other parts of the country, leaving more than 200 people dead. Yet there has been no independent or credible investigation into any of this violence. Serious allegations that security forces took part in attacks or failed to protect those targeted have gone uninvestigated. Instead, Muslims continue to be disproportionately picked on for arrest . The violence has forced tens of thousands of mainly Rohingya to flee their homes. Almost 140,000 men, women and children live in official camps for internally displaced people (IDP). Rohingya Muslims facing persecution at home have been crossing over to Bangladesh for two decades. Until now Burma has not responded to Dhaka’s calls to take them back. Humanitarian crisis in often appalling conditions, without sustained access to necessities like food or medicine. The situation has grown even more desperate since February and March, when a number of humanitarian organizations and international aid agencies were forced out of Rakhine. Long considered by many locals as biased towards the Rohingya, some organizations faced attacks and others chose to leave, fearing they couldn’t guarantee the safety of their operations. Although many of them have begun to return. In October, a draft of the government’s Rakhine State Action Plan was leaked. The draft plan looks set to entrench and expand discriminatory laws and policies if implemented. The Rohingya would effectively be left with a choice to accept second-class citizenship — revocable at any time — or risk being housed in detention camps ahead of possible deportation. The leaked plan appears to have triggered a new wave of people fleeing the Bay of Bengal in boats, adding to the more than 87,000 who have fled by sea since 2012, according to the UN. Bangladeshi President Abdul Hamid urged the Burmese President Thein Sein to work with him to find an effective and permanent solution to the long-running Rohingya issue when the pair met on 9th November,2014 at Diaoyutai State Guest House in Beijing, China, prior to the APEC CEO Summit. UN SG Ban Ki-moon: United Nations Secretary-General Ban Ki-moon has used a press conference in Naypyidaw on Wednesday, November 12,2014 to call for greater protections for ethnic minorities in Burma. While his earlier address to the 6th Asean-UN Summit praised the steps taken by the Burmese government to foster a democratic transition in the country, the UN chief told journalists that he had raised human rights issues in a meeting with senior government leaders. “I encouraged Myanmar leaders to uphold human rights, take a strong stance against incitement, and ensure humanitarian access to Rohingya living in vulnerable conditions,” he said. Ban says he will reiterate this message when he meets with President Thein Sein Thursday morning, November 13, 2014.Reiterating concerns expressed by Ban in an earlier report to the UN General Assembly’s Third Committee, the Secretary-General said that the plight of stateless Rohingya in Arakan State was of the utmost concern, adding that concerns remains over the government’s unilateral efforts to offer conditional citizenship to some members of the Muslim minority. “Myanmar authorities are carrying out a verification exercise in Rakhine [Arakan] to process the granting of citizenship to people in Rakhine. While the process is being carried out in accordance with national law, it should also be in line with international standards and guidelines, he said. Ban also said the UN would stick to using the term Rohingya, despite objections by the Burmese government and Arakanese Buddhist community. “The affected population—referred to as Bengalis by the government of Myanmar but known as Rohingya in the United Nations and in much of the international community—the United Nations uses that word based on the rights of minorities. I also urge the authorities to avoid measures that could entrench the current segregation between communities… Efforts must be made to foster interfaith dialogue and harmony to bring communities closer together,” he said. 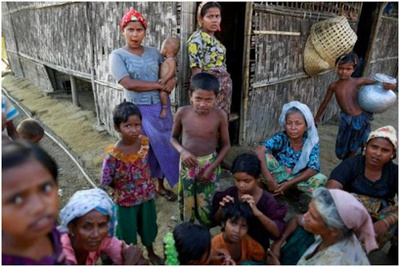 Unites States: The USA on Thursday urged Burma to draft a new plan to allow the ethnic Rohingya minority to become citizens and to scrap a proposed plan to send them to detention camps if they refuse to identify themselves as Bengalis. Most of Burma’s 1.1 million Rohingya Muslims are stateless and live in apartheid-like conditions in Arakan State on the west coast of the predominantly Buddhist country. Almost 140,000 are displaced after deadly clashes with ethnic Arakanese Buddhists in 2012. The Rakhine [Arakan] State Action Plan will require Rohingya to identify themselves as Bengali—a term most reject because it implies they are immigrants from Bangladesh despite having lived in Burma for generations— in order to possibly receive citizenship. According to a draft of the plan obtained by Reuters in September, 2014 the government has proposed that authorities “construct temporary camps in required numbers for those who refuse to be registered and those without adequate documents. “We would like to see a new plan that will allow the Rohingya to become citizens through a normal process without having to do that type of self-identification,” he told reporters in Burma’s capital, Naypyidaw, where US President Barack Obama is meeting with leaders at a regional summit. Obama told local news website and magazine The Irrawaddy in an interview published Wednesday that Burma is “backsliding” on reforms, citing issues including a crackdown on journalists and the treatment of the Rohingya. The United States called for Myanmar to allow stateless Rohingya Muslims to become citizens, after Obama said he was ‘deeply concerned’ about the marginalized group. Nevertheless, It is crystal clear that International community including the UN and the USA recognized Rohingya Muslims as of Burma`s ethnic minority and also reaffirmed that every minority people has rights of self-identification of its own ethnic identity. The Burmese government and the Rakhine`s disagreeing with the term "Rohingya" is a political motivation which is against international minority law and humanity. However, now UN should take responsibility for the protection of vulnerable Rohingyas and at the same time the international community should come forward to pressurize Myanmar government to stop persecution on Rohingyas and return their citizenship unconditionally.